Recently, pictures of the wedding ring that Brad Pitt has designed for wife-to-be Angelina Jolie have been released. Undoubtedly, replicas of such rings are soon to follow. Kate Middleton’s sapphire ring has yielded many imitations and there is no reason to believe that Angelina’s ring will be any different. Some have speculated that Brad may seek legal protection to maintain the exclusivity of the ring. One of the requirements for attaining copyright protection for such is that the design contains originality. Arguably that requirement is easily satisfied and Brad should have no problem as it took the jeweler over a year to obtain certain emerald-cut diamonds to use in the ring. Yet it seems unlikely that lawsuits will be brought since for an infringement suit to be successful the knockoff must be exact. 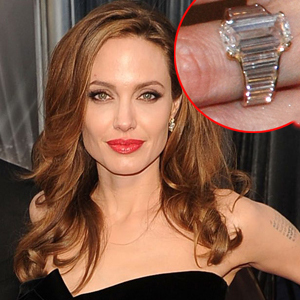 Practically all of these future duplicates are likely to just be “inspired” by Angelina’s ring or close imitations. It is important to note that Mr. Pitt has previously tried covering his basis by filing a similar lawsuit. In 2000, Brad Pitt presented his own custom design to an Italian jeweler named Silvia Damiani. Damiani who created the famous Jennifer Aniston/Brad Pitt wedding rings, both engraved with the names Jen 2000 and Brad 2000. Jennifer’s 18k white gold band featured twenty inset diamonds encircling each side of the ring. Brad’s ring was simpler and featured a simple broader space of ten inset white diamonds. The couple reportedly paid the jeweler £36 million for the wedding and engagement rings. According to reports, soon thereafter, Brad Pitt and Jennifer Anniston filed a multi-million dollar lawsuit against Damiani for replicating Pitt’s custom design, alleging that Damiani “embarked upon an outrageous, fraudulent scheme to manufacture copies of Aniston’s engagement ring and the couple’s wedding rings.” The new Damiani rings were being sold online and featured the same 10/20 diamond design as Pitt’s prototype with diamonds costing $1000.00 a piece. Eventually, the lawsuit was later settled in favor of Pitt and Aniston and Damiani was barred from using the design. With this is mind, potential replicators should beware that Brad may come after them. If exact copies of the rings do hit the market we won’t be surprised if, resurfacing like his role in Sleepers, Pitt brings the wrongdoer to court.